I feel like designers always outdo themselves each fall with even cuter styles for flats than the last. A jewel-encrusted heel, a cool print or a fun fabric can jazz up even the most comfortable slip-ons. I’ve had my eye on this pair (looks like Lanvin but under $200!) – it comes in two shades… and who can say no to that bow?! As much as I love heels, I do prefer flats for their practicality. I’m glad designers started giving us fabulous options! I’m all about comfy & stylish flats for running around town – this is a great round up! I love this post! I have been having a moment with flats, pointed to ones more specifically, since I purchased my Joie silk patterned ones a few months ago. A sophisticated shape and design can really pull an outfit together. This is the best collection of shoes I’ve seen this fall! 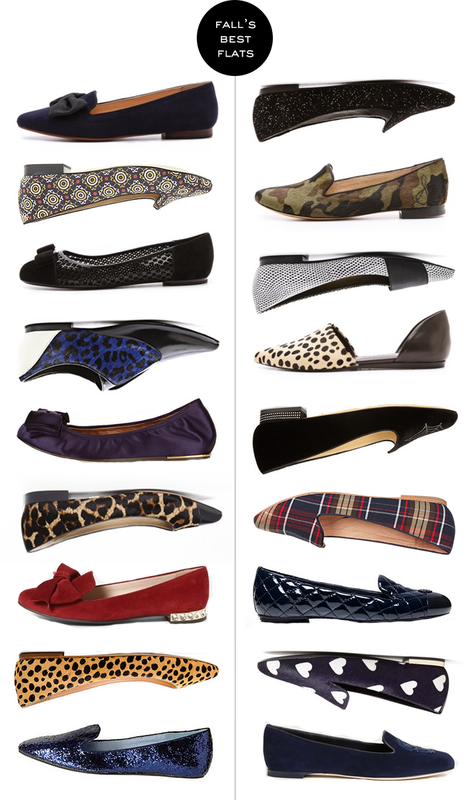 Such a great collection and really, can you ever have too many great flats? i love that bow pair! i need new fall flats but there are always so many good options i can never decide! Beautiful flats! The plaid, the camo and the animal print are perfect! Great roundup! I adore the Ferragamo flats. Ahhh love all of these! I have a serious flats obsession. I totally agree they get better each year. I feel like I can remember a time when they were boring. Now we have so many to choose from! Yay! These are all fabulous!! Love the quilted Tory Burch ones. And the Miu Miu ones are gorgeous! Oh yes! Fab round-up! Loving the white and black hearts! So bold and fun. The plaid loafers are cute too! This post is like heaven to me because I live in flats! I love classic colors but love just as much the fun, patterned or colorful pairs. Love the leopard pair and the glittery loafers. So, so good. Omg I want them all. I’ve been dying over the Burberry flats!